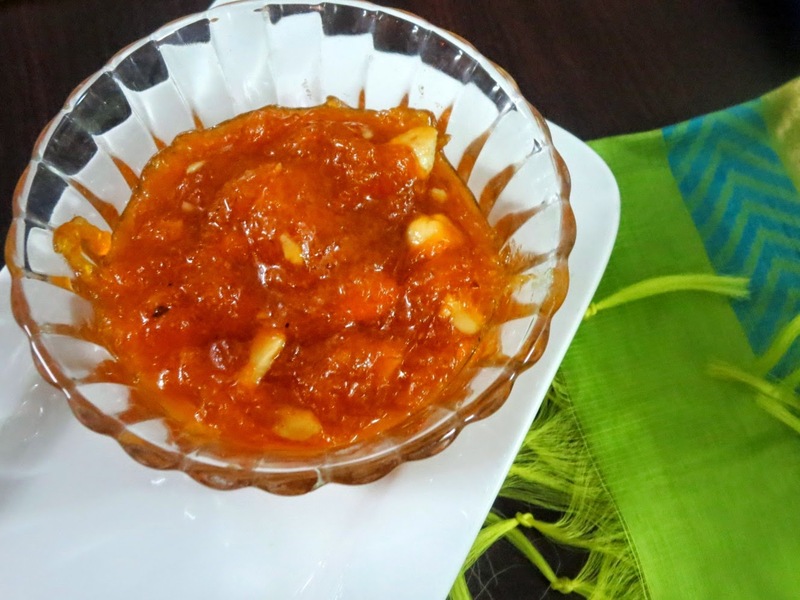 Kasi Halwa is a Traditional Halwa from Tamil Nadu made with White Pumpkin. White Pumpkin is called Poosanikai in Tamil, Boodida Gumadikaya in Telugu. White Pumpkin is also known as Ash Gourd and Winter melon. Coming to the halwa, I must have noticed this halwa being served in weddings and have always looked forward to eating it. At some point I must have even asked what it's called. The memory is so vague, on how I actually know or remember this halwa. However when I recently got exposed to this dish again, I was remembering all the occasions that I have tasted this. 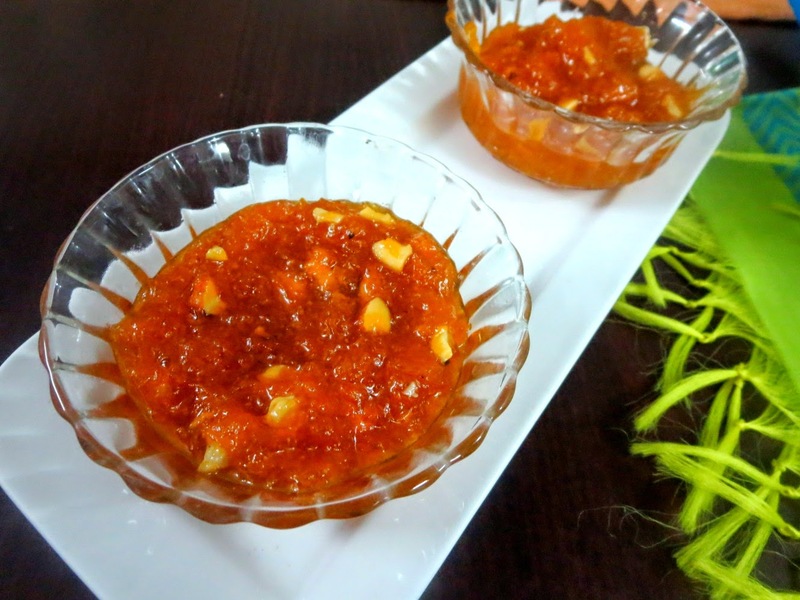 I say tasted as you only get to be served a teaspoon of this halwa. That was mostly more than enough as it used to be very sweet and nectar like. We keep accumulating information that you hardly remember where you learnt about certain dishes. 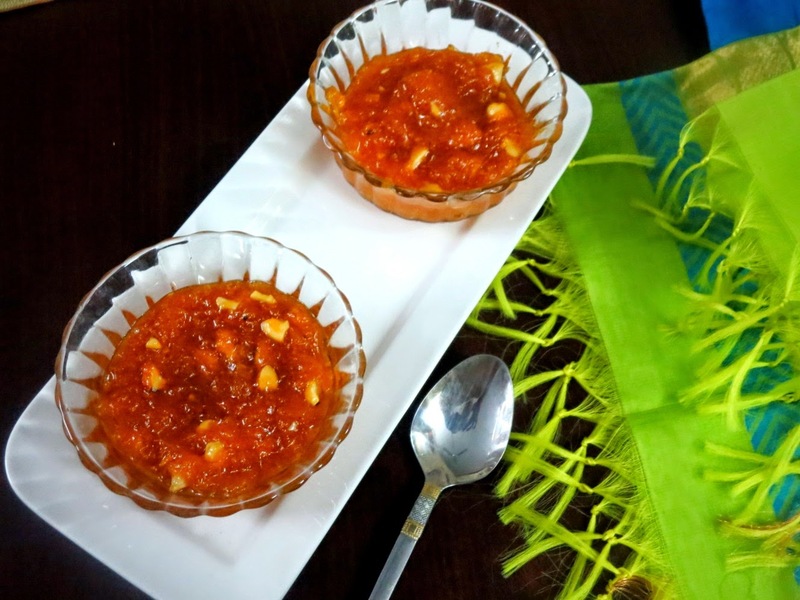 Imagine living in Tamil Nadu and being crazy about cooking all the Halwas possible, I completely forgot about this delicious halwa. During December we have a staff entertainment activity going on at work. Each year a small group is selected to organise the events that run through the month. This year it was Budget Kiladi, each team has to cook for the entire week during December within a given budget. Out of the four teams, mine was the first to cook. Well everybody actually wanted that. Of course I had zero adherence to budget and I was more keen on cooking from each state on each day. More on what we cooked and enjoyed will come later. For today, this dish was featured on Monday. They got about 20 kgs of White pumpkin and served for about 70+ crowd. The moment the team said it was posssanikai halwa, I said yes Kasi Halwa! Though it is quite laborious, the final halwa tastes heavenly! Infact it is so hard to imagine how just the pumpkin and sugar can make so much magic. Except for the roasted nuts, there is nothing else. I was still deliberating on my third day Indian Dessert, it suddenly struck me that I could make this at home. 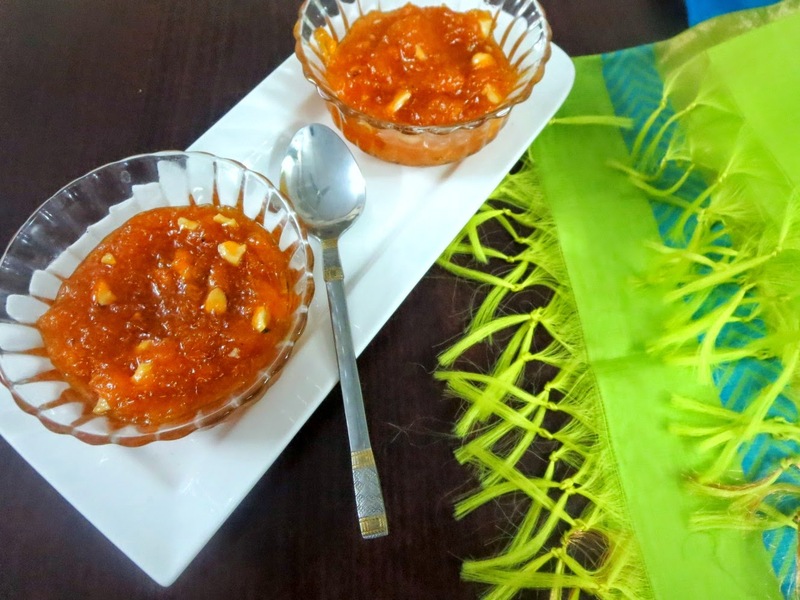 So for the third and final day under BM#47 for Indian Desserts, I have Kasi Halwa, a delicious halwa made with White Pumpkin. I got about 1/2 kg of pumpkin and ventured at making it as I was cooking dinner. Since it really takes long time for all the water to evaporate, it's best when you have this going along with your regular cooking. Konda helped me with grating some of the pieces. Rest I got it done in a jiffy. Most important thing to remember is to use a grater that has wide wholes. I used a very big one, yet after the halwa was done, I found it all melted and soft. So using a smaller hole will result in more water and nothing for you to use. I got about 6 cups of grated pumpkin and so much water. I thought I might use the water, but it will take longer time for the water to evaporate again. Since the halwa that was made in the office was more watery, I wanted to make it thick and used about 2 tbsp of Condensed milk and much more than required nuts. For a moment I wondered if it was Kasi halwa or cashew halwa! The halwa was also very sweet, so just a cup of sugar is enough. Konda couldn't eat saying it's so sweet for her. However hubby dear who got to eat this the next day, when I wasn't around, asked me which shop I got the halwa. He said it tasted absolutely delicious and would surely want me to make it again for him. This is yet another sweet that can be served chilled or hot! 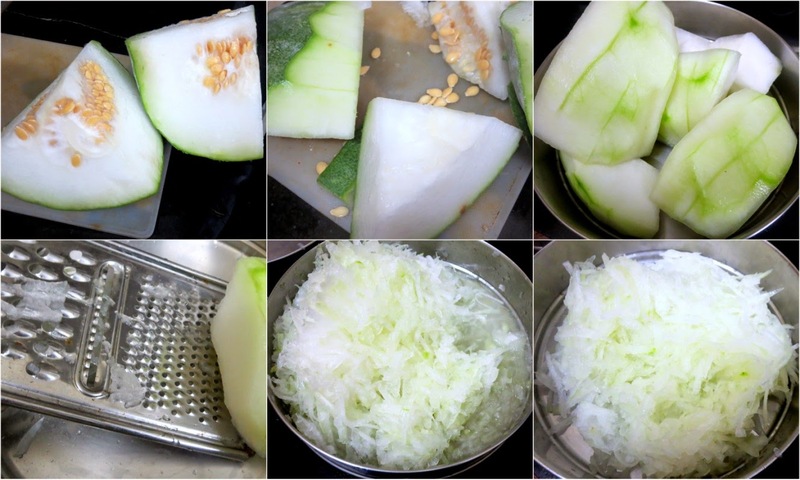 Wash and peel the outer skin, and seeds. Using a grater that has big holes, grate the pumpkin. Once done, squeeze out the water. Heat a non stick pan, add a tbsp of ghee, grated pumpkin. simmer and cook till all the water is evaporated. In low flame, it takes about 30 mins of cooking. This can be done if you want to let it get cooked on its own. Else keep an eye and keep stirring till the water gets evaported quickly. 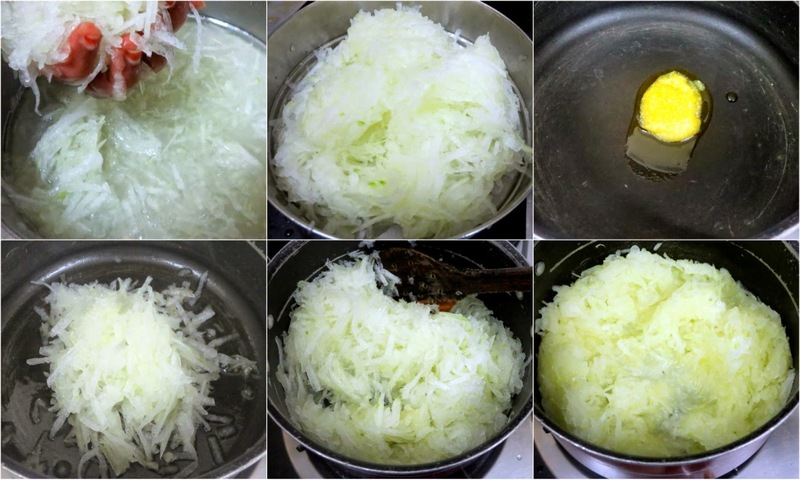 When the vegetable comes together and you don't find much water, add sugar, kesar colour powder and combine everything well. As the sugar melts you will find more water. So keep stirring again until you find most of the water has evaporated again and you have the caramelised texture appearing. Add cardamon powder, adjust sweetness and add the condensed milk. Quickly stir everything together and simmer. 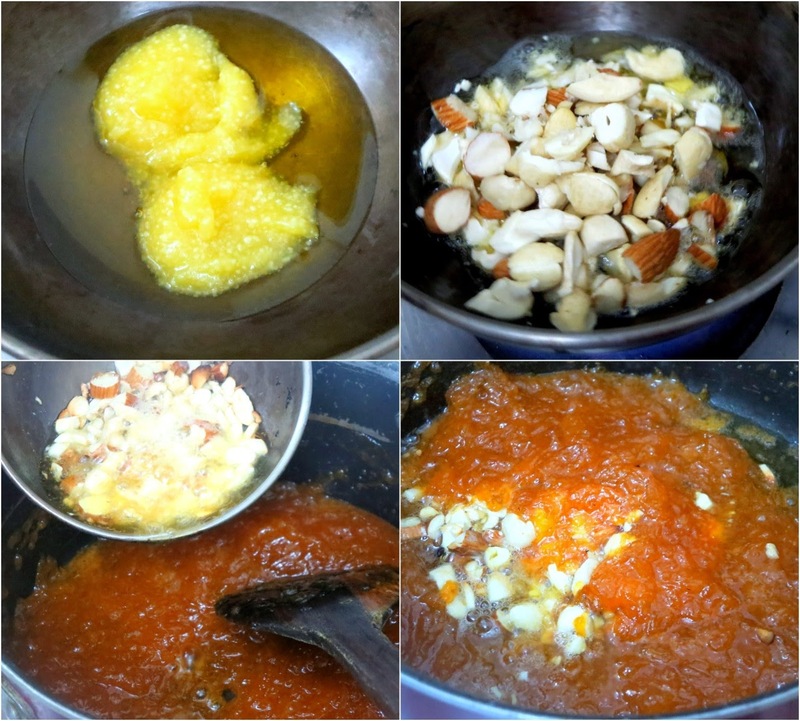 Heat a pan with ghee, roast chopped nuts and pour over the halwa. At this stage the halwa is almost done. After couple of more stirs, switch off. Adding condensed milk is optional. 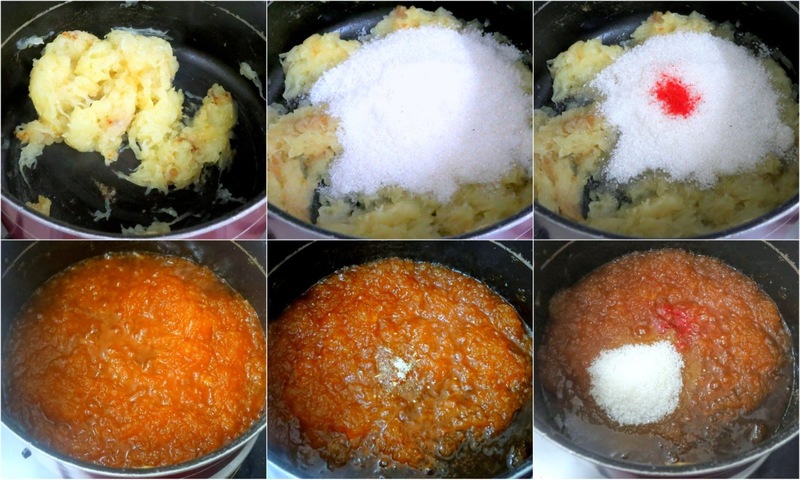 The halwa has a different texture, more watery if you don't add condensed milk. Using kesar colour gives a wonderful appeal and look to the halwa! One cup of sugar was more than enough, more than that it will be very sweet and you won't be able to eat more than a teaspoon.